1. Light a barbecue, brush the corn on the cob with some of the olive oil, season and place on the prepared barbecue. Cook the sweetcorn for about 6 minutes, turning regularly, until it is cooked through and lightly browned. Leave to cool. 2. Mix together the remaining ingredients, reserving the tuna. Taste and adjust seasoning as you wish. 3. When the corn on the cob is cool enough to handle use a knife to cut down the sides of the cob to release the kernels. Add the cooked kernels to the salsa and leave to one side. 4. 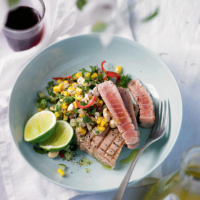 Brush the tuna steaks with a little olive oil and season. Place the steaks directly on to the barbecue grill and cook for about 2 minutes on each side. Serve with the salsa.